About After shooting many redtail hawks and feeling as though I needed a change I went to find a red shoulder, It is a much different hawk to shoot. They are less Trusting of humans and will fly at the first sight of one, and they dont come back so you get only a couple of shots should you see one. Extraordinary beautiful image of a bird in motion,so vivid colours and nice details ,excellent photo. This is wonderful, Marcus. Your good friend Larry Fosse said I should look at your portfolio and I'm very glad I did. Very impressive. I like shooting birds, (photographically of course), also, but mine are much easier to find, and also not so timid. Cheers, Ann. Truly amazing capture Marcus, the lighting and detail are just awesome ! Perfect shot. Great details and DOF. Very well done, Marcus. wow. awesome. i am speechless. Thanks Paul, I have been through the Blind thing a few times, I find that the birds that know the area and see a object that was not there earlier stay clear. I think much has to do with were you shoot, a area which I along with yamil frequent is populated by the same birds for the most part and they notice anything out of place, I think in places where you are trying to catch the bird passing through hunting, they are more effective as they dont know the terrian as well. Unbelievable. You're just too good, my friend. How do you find the 400 prime over the 100-400 in terms of performance? I assume you got it at some horribly low price over there in the US? About £4000 here in the UK... Ouch! Very nice work (again as usual). This is the most colorful hawk I've ever seen. I like having the tree in the background btw. These are extraordinarily difficult shots, not to mention finding a hawk. Splendid colors and very good nice moment captured, Marcus. Love the details and angle here. Very well done, my friend! superbe image !! celle-ci peur être reprise pour devenir un symbole du drapeau des ''amoureux des oiseaux'' , à bientôt.. Dazzling shot, Marcus ~ a truly spectacular capture! Congratulations on your consistently high standard of work! Another wonderful shot! I like specially plumage disposition, very well done. Hi Marcus thanks to you i am learning fast about these birds ,love,subhash. This is really nice Marcus. I like the tree in the b/g...it really sets hinm off nicely. Nice quick trigger finger too! I wondered about the distracting trees too when I saw the thumbnail, but about tells the story. I think you were right to leave them in as they are part of the story of the hawk escaping into the trees. Perhaps some of the branches around the head could have been removed as a compromise, but I think the details and exposure of the head are excellent and it isn't really necessary. Probably would have been less distracting at the back rather than behind the face thats all. Cant really do much about it in most cases. I wouldnt go so far as to retouch out the back tho. You are a Hero Marcus . This is a very nice shot one of the best in Internet. the tree in the background looks very good,makes this one different from the other shots. Another excellent capture!! Beautiful colors and nice feathers on this bird. Another great avian shot well captured. Wonderful shot of this hawk, Marcus! I'm glad you were able to make the most of your opportunity! 7++++++++++++ what an incredible super pic my dear friend!! As usual great shot Marcus. 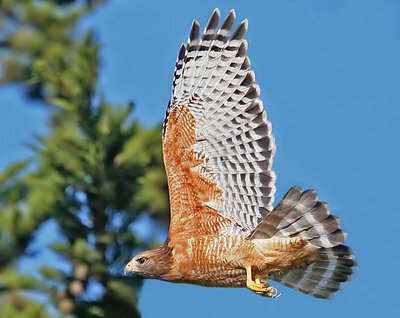 I have seen only a couple of these elusive hawks in Rancho San Antonio. But like you said, they do not tolerate humans. You were right, they are very pretty. Congratulations for this awesome shot. Beautiful capure, this should be Pic of the Day easily! Glad you included the 'about' as it takes this image up a notch..if that is possible!! Great dof and focus! Congratulations! you got a wonderful moment and with great details and colors,very best regards. He looks so pissed off at you. As far as your "about" is concerned, I think if the challenge was not there, then the images would mean much less to you. I could probably go and shoot Canada Geese all day long from close up, but I never do :) Come to think of it, they would be good to practice on. This image has more power that we could write about it! Gongrats for such spectacular shot!